The arrival of more than half a million Rohingya refugees who have fled an army crackdown in Myanmar's troubled Rakhine state since August 25 has put an immense strain on already packed camps in Bangladesh. A top UN official said Saturday Bangladesh's plan to build the world's biggest refugee camp for 800,000-plus Rohingya Muslims was dangerous because overcrowding could heighten the risks of deadly diseases spreading quickly. Hard-pressed Bangladesh authorities plan to expand a refugee camp at Kutupalong near the border town of Cox's Bazar to accommodate the Rohingya. "When you concentrate too many people into a very small area, particularly the people who are very vulnerable to diseases, it is dangerous," Watkins told AFP. "There are stronger possibilities, if there are any infectious diseases that spread, that will spread very quickly," he said, also highlighting fire risks in the camps. "It is much easier to manage people, manage the health situation and security situation if there are a number of different camps rather than one concentrated camp." At Dhaka's request the UN's International Organization for Migration (IOM) has agreed to coordinate the work of aid agencies and help build shelters at the new camp site. According to the IOM, the proposed camp will be the world's largest, dwarfing Bidi Bidi in Uganda and Dadaab in Kenya -- both housing around 300,000 refugees. Three thousand acres (1,200 hectares) of land next to the existing Kutupalong camp have been set aside for the project. "700,000 is a big camp... we and our partners will have our work cut out for us", Joel Millman, an IOM spokesman, told reporters in Geneva on Friday. But he added UN agencies "wouldn't be undertaking this if we didn't think it was feasible". An estimated 331,000 Rohingya have already set up makeshift shelters in the area before construction begins, according to Watkins. Bangladeshi officials say the new camp will help them better handle relief operations and manage security amid fears that dispersed camps could become recruiting grounds for militants. Prime Minister Sheikh Hasina said some refugees would also be relocated to a new island, which emerged from the sea just a decade ago, where they would be provided with shelter, health and education facilities. "We have some plans about the Rohingya. No one can live the way they are living now," she told a rally in Dhaka. The Rohingya have opposed the idea of moving to Bhashan Char island -- also known as Thengar Char -- saying they will be exposed to powerful and deadly cyclones that frequently hit Bangladesh's coastal belt. But Hasina said the government would build cyclone shelters for the refugees. The UN High Commissioner for Refugees Filippo Grandi last month said any relocation to the island should be "voluntary on the part of the refugees". This week Bangladesh reported 4,000-5,000 Rohingya were crossing the border daily. 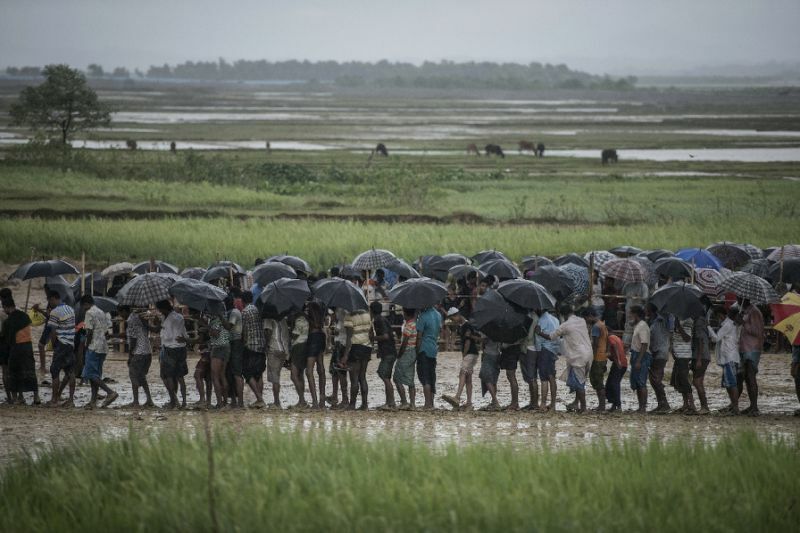 Observers believe, according to an IOM statement on Friday, that as many as 100,000 more people may be waiting to cross into Cox's Bazar from Rakhine's Buthidaung Township. Watkins said the continuing influx represented "a very big challenge" for aid agencies. "Just when we start to think we are getting on top of the situation, the numbers go up. We are not where we need to be right now," he said. "There is still a lot more needed to be done."